Hua Tuo (華佗, 華陀, 华陀, Huá Tuó) (? - 208) was a renowned physician during the Eastern Han Dynasty and Three Kingdoms era of China. He was described as looking like "an immortal who had passed the gates of this life" and "a man with the complexion of a youth and a snowy beard." The Book of Later Han records Hua Tuo as the first person in China to use anesthesia during surgery. He used a general anesthetic combining wine with an herbal concoction called mafeisan (麻沸散 lit. "cannabis boil powder"). Hua Tuo also developed acupuncture and devised the Wuqinxi (五禽戲 "Frolics of the Five Animals"), an exercise to enhance health, based upon the movements of five animals: tiger, deer, bear, ape, and crane. Unfortunately, Cao Cao, a warlord and the Chancellor of the Eastern Han Dynasty whom he served, executed Hua Tuo, which resulted in the loss of his invaluable writings on medical science. Although Hua Tuo's apprentices Wu Pu, Fan E, and Li Dangzhi, partially succeeded his legacy, some historical records indicate his accomplishments permanently lost. Huà Tuó developed the Wuqinxi, 五禽戲, "Frolics of the Five Animals"
Hua Tuo came from Qiao in the State of Pei (modern-day Bozhou, Anhui). Besides being one of the most respected physicians in Chinese history, Hua Tuo devised techniques to enhance health. He developed the Wuqinxi (五禽戲 "Frolics of the Five Animals"), a series of exercises based on movements of the tiger, deer, bear, ape, and crane. He was well known for being able to diagnose miscarriages by examining a woman's pulse and to tell whether the dead fetus was male or female depending on the position of the fetus. He was also famous for ridding people of parasites that had gotten into their bodies from ingesting uncooked meat. Some accounts indicated a snake-like parasite that blocked a man's pharynx, and a "wriggling red headed" parasite that causes ulcers. Dong Xi, a general during the Three Kingdoms era, who had heard of Hua Tuo, introduced him to Sun Ce, a military general and warlord. Hua Tuo healed general Zhou Tai who had been gravely injured in rescuing Sun Ce's brother, Sun Quan. Hua Tuo used drugs that healed Zhou Tai's wounds within a month, and Sun Ce rewarded him richly. Cao Cao, a warlord and Chancellor of the Eastern Han Dynasty, heard about Hua Tuo and summoned him to his court. Henceforth Hua Tuo was often in attendance. Cao Cao suffered from chronic headaches (which many today believe was a brain tumor) and Hua Tuo would treat Cao Cao with acupuncture to stop the pain. Later when Cao Cao had taken personal control of the affairs of the state, his pain became worse and more frequent. Hua Tuo told Cao Cao that this kind of illness would need long term treatments and thus Hua Tuo came to treat Cao Cao exclusively. Having been away from home for a long time, Hua Tuo desired to temporarily return and Cao Cao allowed this. Upon arriving however, Hua Tuo delayed his return to Cao Cao and made excuses to extend his stay citing that his wife was ill. Cao Cao sent many letters requesting for Hua Tuo's return, but Hua found it distasteful waiting hand and foot on others for a living. So he delayed his departure back to Cao Cao. Cao Cao sent agents to investigate the situation and if indeed Hua Tuo was telling the truth and his wife was truly ill, he would bestowed upon them 40 bushels of 'xiao dou' and be lenient on his return date. If he was lying and making false excuses in order to delay his return, then he was to be apprehended and brought back by force. Hua Tuo was then thrown in prison, confessing his fault. 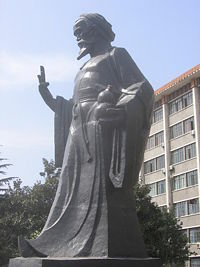 Statue of Hua Tuo (華佗) in front of the Anhui College of Traditional Chinese Medicine in Hefei, the provincial capital of Anhui. Xun Yu, an advisor of Cao Cao petitioned on behalf of Hua Tuo asking Cao Cao to spare him because his skills could save many lives. Cao Cao would pay no heed and ordered for Hua Tuo to be executed. Legend has it that Hua Tuo gave his Qing Nang Shu, which recorded techniques for treating patients, to a prison official before his execution. However, this official, or in some versions of the story his wife, burned the book to avoid being implicated. In another version of the story, Cao Cao ordered all of the written medical works of Hua Tuo be burned. Either way, many of Hua Tuo's medical methods were lost forever. This loss to traditional Chinese medicine was irreplaceable. Veith notes that, "Unfortunately, Hua Tuo's works were destroyed; his surgical practices fell into disuse, with the exception of his method of castration, which continued to be practiced." Even after Hua Tuo's execution, Cao Cao's pain did not go away. Cao Cao cursed "Hua Tuo could have healed me. That rascal didn’t so that he could enhance his own importance on me. Even if I hadn’t killed him, he wouldn’t have healed me and rid me of this source of pain." Soon afterwards, Cao Cao's favorite son Cao Chong fell ill and died. Cao Cao in anguished cried out "I regret putting Hua Tuo to death. In doing so I have condemned my son to death!." Hua Tuo's exact date of death was not specified in Records of Three Kingdoms, but since Cao Chong died in 208 C.E., Hua Tuo could not have lived past that year. In later times, a set of 34 paravertebral acupuncture points was named the "Hua Tuo Jiaji" (華佗夹脊) in his honor. Hua is considered a shenyi (神醫 "divine doctor") and is worshiped as a medicinal god or immortal in Daoist temples. "Hua Tuo zaishi" (華佗再世 "Hua Tuo reincarnated") is a term of respect for a highly skilled doctor. In the historical novel Romance of the Three Kingdoms, Hua Tuo supposedly healed the Shu Han general, Guan Yu, who had been struck with a poisoned arrow during the Battle of Fancheng. Hua Tuo offered to anesthetize Guan Yu, but he simply laughed, saying he was not afraid of pain. Hua Tuo used a knife to cut the flesh from Guan Yu's arm and scrape the poison from the bone, and the sounds chilled all those who heard them. 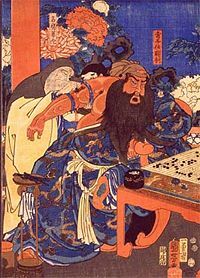 During this excruciating treatment, Guan Yu continued to play the board game Go with Ma Liang, without flinching from pain. When later asked by Ma Liang, Guan Yu said that he feigned being unhurt to keep the morale of the army high. After Hua Tuo's successful operation, Guan Yu allegedly rewarded him with a sumptuous banquet, and offered a present of 100 ounces of gold, but he refused, saying that a doctor's duty was curing patients, not making profits. Despite the historical fact that Hua Tuo died in 208, a decade before Guan Yu fought the 219 Battle of Fancheng, this storied operation is a popular artistic theme. Hua Tuo was later called upon to cure a chronic excruciating pain in Cao Cao's head, which turned out to be a brain tumor. Hua Tuo told Cao Cao that in order to remove the tumor, it would be necessary to open up his skull. However, Cao Cao suspected the doctor of intended murder, and ordered that Hua Tuo be jailed and executed. This was because Ji Ben, a former royal surgeon, had participated in Dong Cheng's assassination plot on Cao Cao (this assassination attempt by Ji Ben however did historically happen). 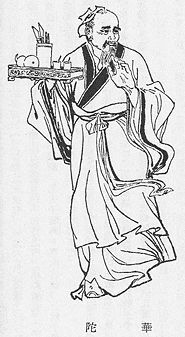 There were a number of notable physicians in ancient China: Qibo, a mythological doctor served for Huangdi (the Yellow Emperor); Bian Que (ca. 500 B.C.E.) the earliest historically recorded physician in the Warring States Period; Sun Simiao (581–682) in the Sui and Tang dynasty; Li Shizhen (1518–1593), one of the greatest physicians and pharmacologists in Chinese history, who wrote Bencao Gangmu Compendium of Materia Medica) in Ming Dynasty. In the long history of Chinese medical sciences, the Book of Later Han records Hua Tuo as the first physician who developed anesthesia for surgery. Records of Three Kingdoms also records a number of cases which Hua Tuo diagnosed and treated. Hua Tuo is also known for his contributions in pharmacology, development of a system of exercises to enhance health, and acupuncture. Unfortunately, Cao Cao, a warlord and Chancellor of the Eastern Han Dynasty whom he served, executed Hua Tuo which resulted in the loss of his writings on invaluable medical discoveries. Although his apprentices such as Wu Pu, Fan E, and Li Dangzhi, partially succeeded his legacy, historical records describe his accomplishments, detailed knowledge of his discoveries were permanently lost from the history of Chinese medical science. ↑ Recorded in Shinji (史記, Records of the Grand Historian). Cai, C. 2007. "Revisit of the Anatomy of Hua Tuo Jai Ji Points." MEDICAL ACUPUNCTURE 19 (3): 125-128. Chan, Eugene. 1985. "Hua Tuo, the Father of Chinese Surgery." Historia Ophthalmologica Internationalis 3. Fan, K.W. 2004. "On Hua Tuo's Position in the History of Chinese Medicine," The American Journal of Chinese Medicine 32(2):313-320. Flaws, B. 1994. "Master Hua's Classic of the Central Viscera: Excerpts from a Translation of Hua Tuo's Zhong Zang Jing." American Journal of Acupuncture 22 (2): 159. Fu, L. K. T. 2002. "Hua Tuo, the Chinese God of Surgery." JOURNAL OF MEDICAL BIOGRAPHY 10: 160-166. Veith, Ilza. Huang Ti Nei Ching Su Wen; The Yellow Emperor's Classic of Internal Medicine. Berkeley: University of California Press, 1966. Wai, F. K. 2004. "On Hua Tuo's Position in the History of Chinese Medicine." AMERICAN JOURNAL OF CHINESE MEDICINE 32 (2): 313-320. All links retrieved January 16, 2018. This page was last modified on 16 January 2018, at 19:48.